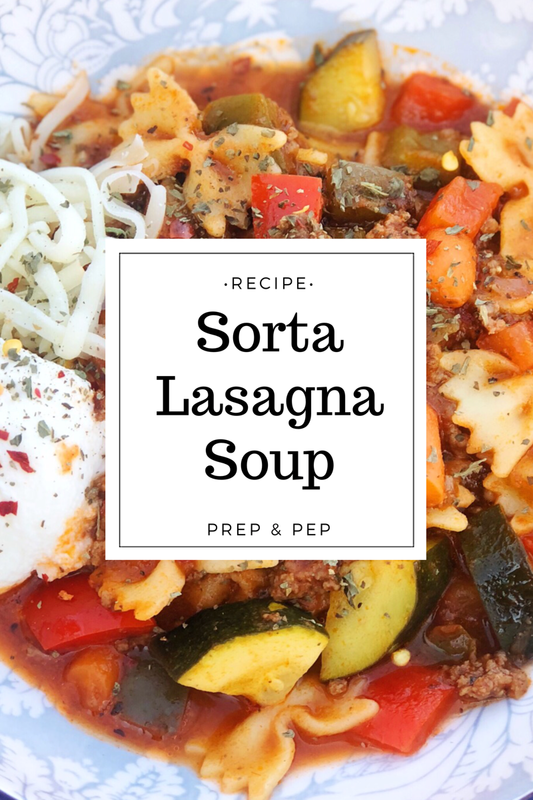 Sorta Lasagna Soup.....but not quite! This soup is inspired by that recipe. I made it the original way once and as always, made it differently every time after until it became my own! One difference is that I use lean ground beef. She uses Italian chicken sausage, but unfortunately, my grocery store does not carry it. Also, I like ground beef because it reminds me of real lasagna. I opt for 93/7. The biggest difference between the original and mine - I LOAD this soup up with veggies. 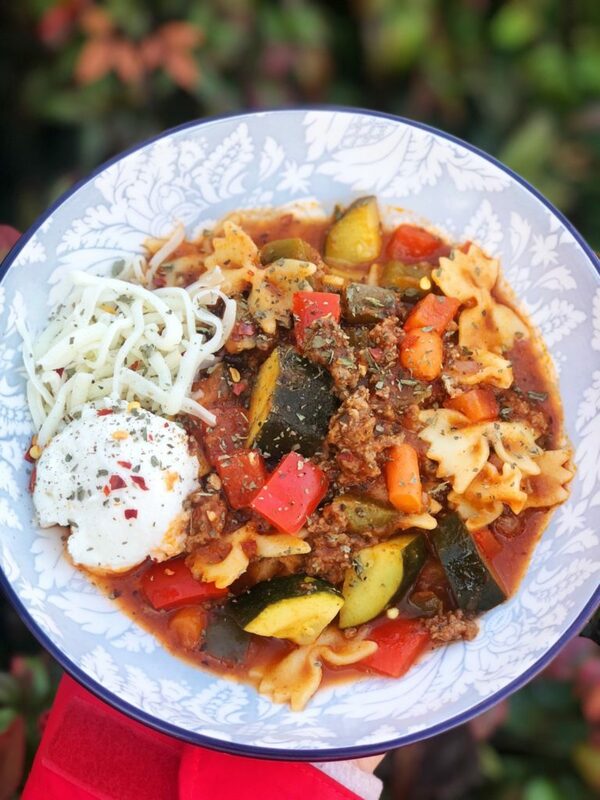 In fact, if you're more plant-based or vegetarian, swap the beef for mushrooms and this would be an awesome Italian Vegetable soup recipe! I add in a whole red and green bell pepper, carrot, and zucchini. As a bonus, I even use Prego's Garden Harvest Chunky Zucchini pasta sauce. You can never have too many vegetables! Another difference is that I use mini bow tie pasta. In her recipe, she uses broken lasagna and I sometimes do this, but truthfully, it can take a little time to break all those lasagna sheets up. Also, I may have injured myself once on a sharp edge when breaking them. (I wish I was kidding). Still, I do love to use whole wheat lasagna noodles when I have time time. I usually go for the mini bow tie pasta because my boys love them and they're just cute! (That's a good reason, right?) You can use whatever pasta you prefer - make it your own! Pasta sauce is used as the base of the soup, but you thin it out with chicken, beef, or vegetable broth and it is DELICIOUS. If you reduce it down to much and the sauce is too thick, just add more broth or water. 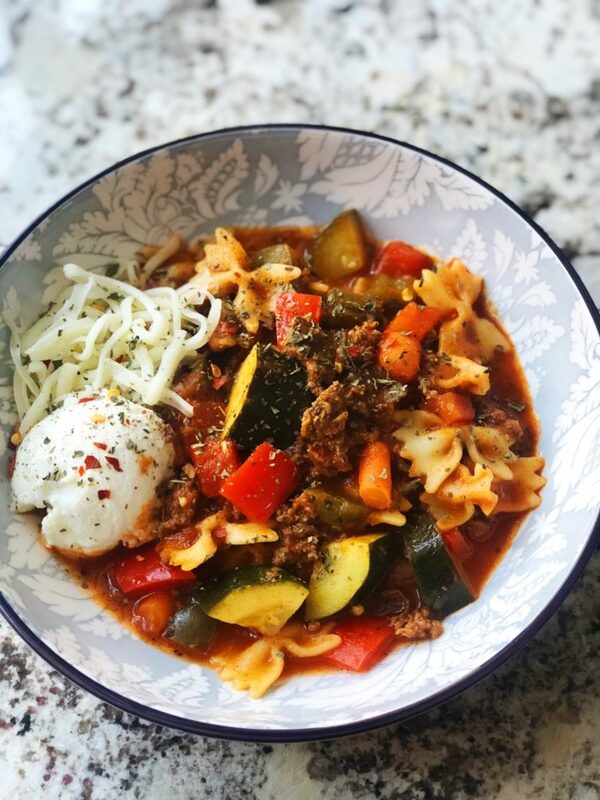 A dollop of ricotta with a little mozzarella sprinkled over this soup truly ties it all together AND ups the protein count! Brown ground beef in a large soup pot over medium heat until no longer pink. Add bell pepper and carrot to pot and cook for 5-7 minutes, or until soft. Add garlic and stir to combine for 30 seconds or until garlic is fragrant. Add pasta sauce and chicken broth to pot and stir to combine ingredients. Add pasta and zucchini to pot and cook for addition 5-10 minutes, until both are soft. Divide soup among six bowls *serving should be about 1 1/4 cup*. Top each bowl with 1 tablespoon ricotta and 1 tablespoon mozzarella. Add any additional toppings desired (red pepper flakes, basil, black pepper, etc.) and enjoy!